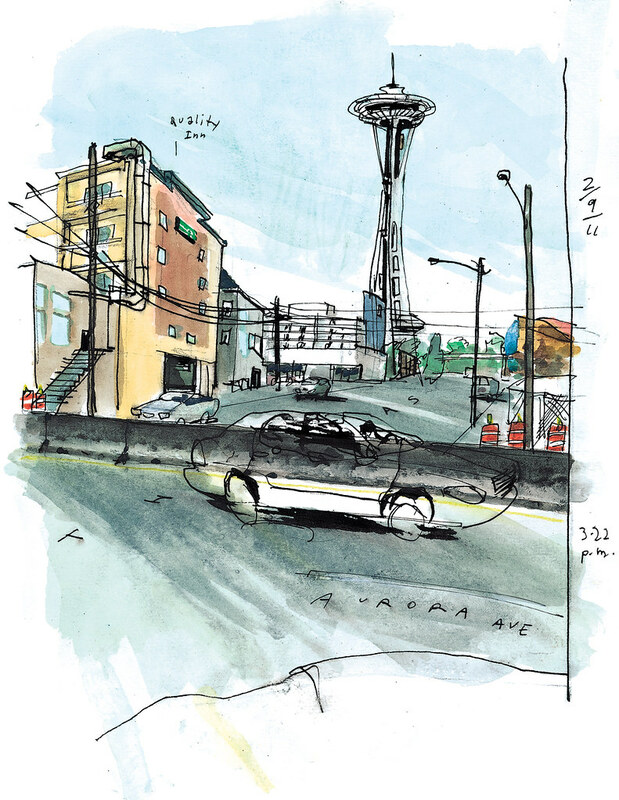 Sketched Feb. 9, 1:53 p.m.
Traffic zooms by on Aurora Avenue, Denny Way and Broad Street, but inside the city blocks isolated by these major thoroughfares, all activity seems to stop. I walked around the sleepy hotel buildings and empty parking lots in the shadow of the Space Needle this week and wondered why. John Coney leads Uptown Alliance, a community group lobbying for smart development in this “lost triangle.” He said the lack of accessibility stopped growth here decades ago. The location, however, will likely attract developers as the barriers start coming down in the next few years. 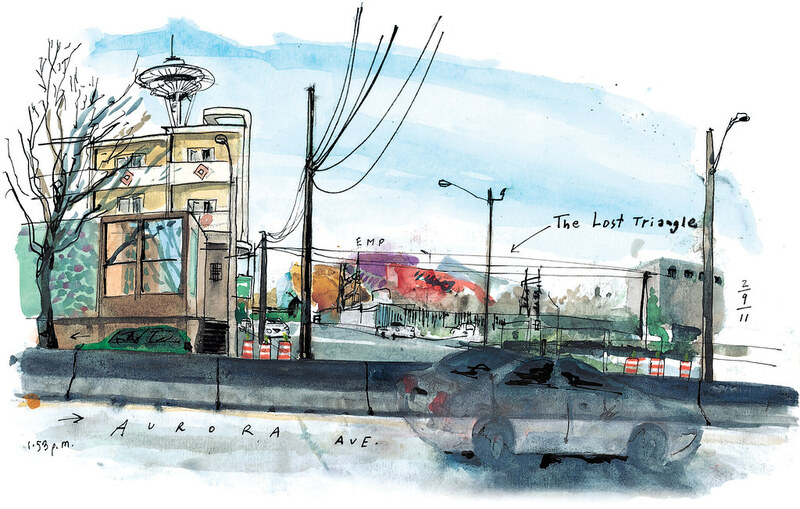 Construction of the deep-bore tunnel will put Highway 99 underground and streets now cut off by Aurora Avenue will be reconnected. With Gates Foundation headquarters to the north opening this spring and Amazon’s campus in nearby South Lake Union nearing completion, I think the Uptown Triangle will find its place on the map soon. I can already picture people munching at sidewalk cafes and bike commuters heading to work. Sketch-worthy Seattle. Where should I take my sketchpad next? Do you know of a good sketch story waiting to be drawn? I’d love to learn about it. You can send me your suggestions to gcampanario@seattletimes.com or via Facebook or Twitter.